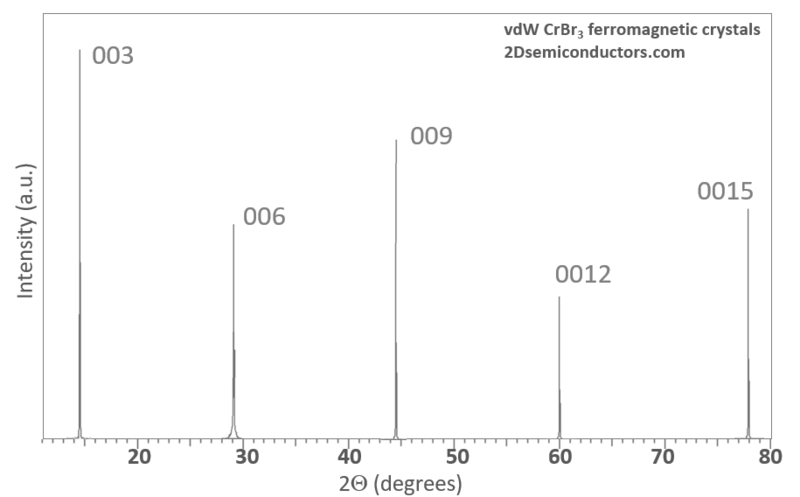 Chromium bromide (CrBr3) is a 2D ferromagnetic semiconductor with a Curie temperature of ~40K. Crystals exhibit perfect 0001 plane orientation as well as perfect in-plane crystallinity as evidenced by XRD and Raman measurements. Layers are largely decoupled from each other and can be exfoliated down to monolayers using conventional mechanical exfoliation technique. CrBr3 is an environmentally sensitive material, we recommend our customer to handle these crystals in the glove box, argon rich environment, or keep them in vacuum boxes prior to actual measurements. All these products are handled using non-magnetic tweezers and in non-magnetic environment with tools that are free of magnetic impurities to ensure intrinsic magnetic properties can be confidently measured and probed.